Easy to assemble and fittings included. Modern, stylish and minimalistic finish. Instructions included. Shelf slides onto wall fixings. Shelf slides onto wall fixings. Modern, stylish and minimalistic finish. 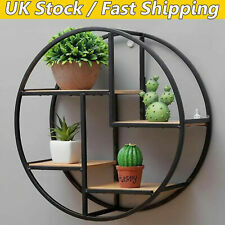 1 x Wall Mounted Iron Shelf Round Floating Shelf Wall Storage Shelf for Pantry Living Room Bedroom Kitchen Entryway. 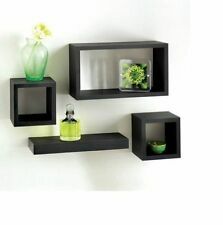 |Simple and heavy duty organizing shelves with ample storage. |It easily and effortlessly to install. Isle of Wight. Isle of Man. Colours: Black. Marked / Rusted areas on the hanging bracket (mostly on the black);. Black 40cm. The rear of the shelf has been left unfinished and may have. Due to these issues we have reduced 75% off the price;. We are professional manufacturer to produce TV Wall Mount,Dog Harness,Dog Bed,Make Up Trolley,Mirrors,Garden Stand,Solar Led,Car Holder products and 3C Accessories. 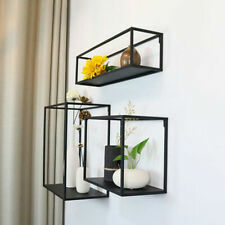 Max.Load: 20KG/each shelf. 3 x Cube shelf. 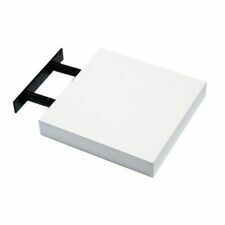 white box wall shelf. Condition is Used. Collect in person can deliver if 1 mile of Dartford. Suitable in any room around the house. Wall Shelf/Peg with 3 Drawers 2 Hooks. They can also be easily removed for cleaning or moving. It also features two solid hooks underneath the drawers for hanging jacket, hat or handbag,etc. Sound & Vision.